WiBEC (Wireless In-Body Environment Communications) is a Horizon 2020 Marie Skłodowska-Curie Innovative Training Network and trains 16 young researchers in coordinated manner by academia, industry and medical centres. 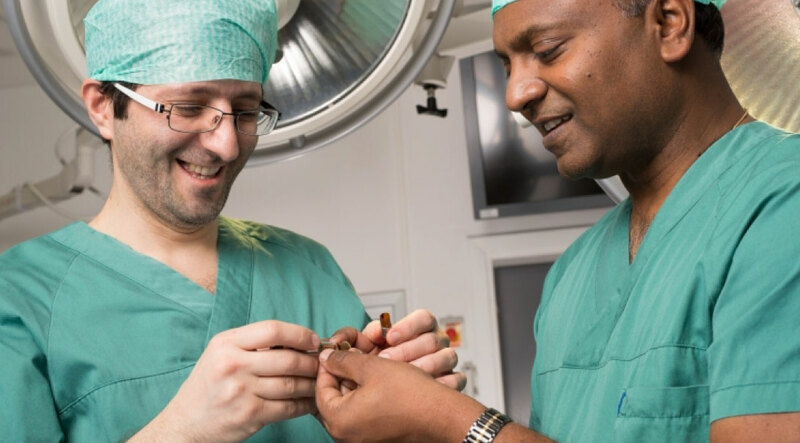 WiBEC is led by Professor Ilangko Balasingham at the Intervention Centre at Oslo University Hospital. WiBEC has been identified by the Innovation Radar - a European Commission initiative to identify high potential innovations and innovators in EU-funded research and innovation framework programmes. WiBEC’s main objective is to provide high quality and innovative doctoral training to develop the wireless technologies for novel implantable devices that will contribute to the improvement in quality and efficacy of healthcare. These are innovations that are actively exploring value creation opportunities and rated by the European Commission as Excellent Science. The project has so far produced 4 innovations where 2 of them are patents filed by the Intervention Centre on wireless communication technology and wireless power transfer for deep implants like leadless pacemakers for heart and wireless robotic capsule endoscopes. These innovations are going into the next phase on application specific verification thanks to the 2-year funding recently provided by the FORNY program at the Research Council of Norway. Being part of the EU’s Innovation Radar enhances scope and changes to bring forward the WiBEC innovations to benefit patients. Read more about WiBEC on CORDIS (find names of contact persons and their phone numbers on the CORDIS page). Details of the WiBEC project on the Horizon 2020 dashboard. WiBEC (Wireless In-Body Environment Communications) is an Innovative Training Network for 16 young researchers, who will be recruited and trained in coordinated manner by Academia, Industry, and Medical Centres. This training will address the Social, Health, and Technology challenges of the H2020:Wireless In-Body Devices. WiBEC’s main objective is to provide high quality and innovative doctoral training to develop the wireless technologies for novel implantable devices that will contribute to the improvement in quality and efficacy of healthcare. Two devices will be used as a focus for the individual researcher’s projects; cardiovascular implants and ingestible capsules to investigate gastro intestinal problems. These devices will enable medical professionals to have timely clinical information at the point of care. The medical motivation is to increase survival rates and improvement of health outcomes with easy and fast diagnosis and treatment. The goal for homecare services is to improve quality of life and independence for patients by enabling ambient assisted living (AAL) at home. In this particular ETN, inter-sectoral and multi-discipline work is essential, as the topic requires cooperation between medical and engineering institutions and industry. This aspect is fulfilled with the participation of two reference hospitals, two medical device manufacturers and three top ranked universities in Europe, covering complementary aspects of the in-body wireless device field. Concerning future employment perspectives; surgery and medical assistance is rapidly becoming more technological than it is today, and a large number of experts combining engineering and medical skills will be required in Europe to enable novel paradigms like AAL to be realised. The ESRs who join this ETN will acquire diverse skills that will enable them to occupy privileged positions to join and promote EU leadership in ICT for Health.